THE LOWER BOATHOUSE is a spectacular river-side venue, intimate and atmospheric, set along side the River Cherwell in Oxford. In this context it lends itself readily to summer-time music and theatre art events. This is the third summer season music evening in the Lower Boathouse. 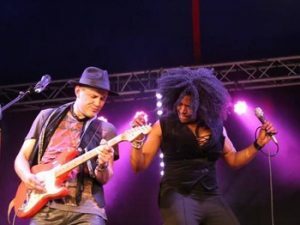 It promises to be a great evening of blues by Kat&Co offering a unique approach to blues music; rich and deep with a soul-ish approach. Kat’s very rich vocal is complimented by instrumental accompaniment that has a stylish sound from very accomplished musicians. Kat brings with her the heart of a style that originated in America and is loved by the world! Coming from a long line of Gospel hymns, Blues hummers and Soul singers Kathleen sings through her heart and from the depths of her soul. Kathleens face has appeared on the cover of ID magazine and in the video of the hit single ‘Block Rockin Beats’.by the Chemical Brothers. Maybe you would have heard her voice to a standing ovation crowd at Montreaux Festival or guesting on the D:Ream’s hit single ‘Things Can Only Get Better’. Kathleen has shared the stage with LuLu, Lurrie Bell, Mud Morganfield (Muddy Waters Junior), Jason Robello, Tony Remy, Lil Jimmy Reed and also with Chicago Blues Queens Peaches Statton and Deitra Farr; to name but a few. Francesco began his music studies in Italy with maestro G. La Monica and moved later onto Los Angeles to complete his studies with Scott Henderson, Carl Schroeder and many others at the world famous Musician’s Institute Of Technology in Hollywood CA. His love for the blues saw him share stage with the likes of Joe Louis Walker, Lurrie Bell, Mud Morganfield and Lil Jimmy Reed. He opened for some of the biggest names in the industry from Charlie Musselwhite to Sugar Blue. After completing his Jazz Piano studies at Centro Jazz Torino Italy Federico moved to London where he has been constantly performing on the London Blues curcuit. With residences at ‘Charlotte Street Blues’ and ‘Aint Nothing But’ as part of the house band, he had the chance to perform with some of Londons most influential musicians. He has opened for many international artists- Lurrie Bell and Deitra Farr to name just two of many. He is also a BAFTA award winning animator and video maker; his shorts have been selected in many festivals arround the world. Federico brings to the band chunky Hammond chops, a pinch of soul plus striking visuals; dont miss the first Kat&Co. official vidoe clip ‘New Spleen Blues’. Nick began playing drums on pots and pans at the tender age of five, inspired by the fantastic sound and energy of Ringo Star with The Beatles. By seventeen he was reviewed for a track in Rhythm magazine and given a 4.5/5 rating. Nick has performed, written and recorded with many great artists in the Blues world, namely Mud Morganfield, Lurrie Bell, Lil Jimmy Reed, Bob Hall and supporting high profile artists such as The Editors, Hundred Reasons, Jamie Cullam, Mos Def and many others. Nick has worked on numerous occasions with companies like the BBC on documentary soundtracks, adverts (Garmin etc) and with multiple radio and TV apperances. His solid punchy groove and creative electic style brings to the band the modern and distinctive edge which clearly defines its sound. Marco’s artistice formation started in the consevatory of Ferrara in Italy. Finding his first love in jazz he moved to New York, where he studied with Barry Harris and Buster Williams. Marco has shared the stage and recorded with many great jazz musicians in Europe and the United States, these include Betty Carter, Jimmy Cobb, Sherman Irby, Flavio Boltro, Jimmy Lovelace and Stefano Bollani. With his fine playing, Marco adds that touch of swing to all Kat&Co grooves, helping to consolidate the classy night club feel that characterises their style.